Alvarez Artist Series AD30 – Want To Go On A Riot? The AD30 is an entry level instrument (present in our beginner section) in Alvarez’s mightily praised Artist Series. While it may be the “cheapest” of them all, it still competes quite well with its bigger brothers and sisters on a sound quality level. The Alvarez Artist AD30 is an extremely valuable selection for a beginner, in fact; it was built for that purpose. This model truly squeezes the maximum potential out of its components, with a refined solid top and quality hardware the sound potential is nigh limitless. The instrument exhibits the expert craftsmanship of the designers, which have naturally brought it on par with the rest of the series. There is also [aa link asin=B00EEDGV2A]an acoustic-electric version[/link] of this guitar. The instrument’s body is made of a solid Sitka spruce top, which comes equipped with a tiny black pick guard. The back and sides are made of mahogany, highlighting the guitar’s genuine value. The body is held together by the hand sanded, scalloped bracing. The mahogany neck is dovetail joint, sporting a wider profile, which is only natural for a dreadnought shaped guitar. The neck accommodates a rosewood fingerboard – rigged with 20 frets, white dot inlays and a fitting bone nut. Both the body and neck have a gorgeous, natural semi-gloss finish. Arguably the main reason for the Artist’s Series high appraisal status is the equally stunning hardware quality across all of their instruments. The AD30 is no different here, featuring top-notch components surpassing its price. The D’Addario EXP strings are kept in tune by the Alvarez bi-level rosewood bridge system and the six die cast chrome tuners situated atop the headstock – stylishly rounding off the instrument. Despite the fact that we have a full sized dreadnought acoustic on our hands, the instrument’s top is cut slightly thinner in order to provide amazing vibrations and striking tonal versatility, bumping it slightly towards new heights. The tones have a fine equivalent balance between its bass and treble sides, making you stand out with unparalleled clarity. The instrument will certainly appeal to anyone in its current possession. However, the light D’Addario strings make it speak extremely well in particular to a beginner. That combined with its high class features makes the AD-30 the only guitar you will ever need for the foreseeable future. This piece of work by Alvarez is undoubtedly the best selection for a rock star in the making, and despite its obvious target audience, it can shine through the hands of an experienced maestro quite easily. If you’re looking for a guitar in this range and type, the AD-30 is a must-have and one of my top recommendations. 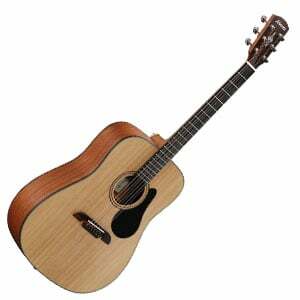 For more beginner acoustic guitars, click here. Just bought one from a friend and the first few strums immediately said it all..I’m in complete agreement with the above comments..beautiful guitar in every appointment. By other owners, it’s been likened unto a road series Martin, maybe even better?! That’s what it spoke to me when I first heard it ..Martin. This is one of those entry level sleepers that no one should be ashamed to play professionally. Get it, you’ll be glad you did!